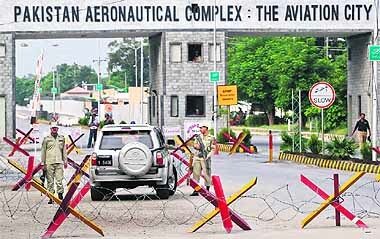 In a brazen pre-dawn assault, heavily-armed Taliban terrorists donning suicide vests on Thursday stormed a key Pakistan Air Force base believed to house nuclear weapons. A Delhi court on Thursday issued a non-bailable warrant (NBW) against absconding Haryana ex-minister Gopal Goyal Kanda, accused of abetting the suicide of former air hostess Geetika Sharma, even as the Delhi Police picked up his relative from Sirsa for questioning. Country�s largest car-maker Maruti Suzuki India Ltd (MSIL) has terminated the services of over 500 regular workers employed at its Manesar plant which had witnessed unprecedented violence last month leading to the death of a senior executive and injuries to a large number of other executives. The company plans to restart production at the Manesar factory on August 21, a day after the Chairman of its parent company, Suzuki Motor Corp (SMC), Osamu Suzuki arrives on a week-long visit to India. A day after the country celebrated its 66th Independence Day, the spectre of violence on ethnic and communal lines returned to haunt the people. Assam Chief Minister Tarun Gogoi today blamed it on rumour mongering over recent violence in the state that created panic among students and people from Assam and other parts of N-E living in southern states and Maharashtra. From the next academic session, admissions to all central universities like the University of Delhi, Jawaharlal Nehru University, Jamia Millia Islamia and the ones located in states will be held through a common entrance test. Two separate petitions filed by two groups of lawyers were admitted to the Calcutta High Court today against West Bengal Chief Minister Mamata Banerjee for defaming and denigrating the country�s judicial system.